Evra attended United’s 3-1 Champions League win over PSG this month, which knocked the French club out of the competition. At this point, Evra is alleged to have made two anti-gay slurs about PSG, before curtly adding “we’re men speaking here”. PSG released a statement on Tuesday condemning what the club say were “homophobic insults”. “These remarks profoundly shocked the club, which is particularly committed to the values of respect and inclusiveness,” PSG added. 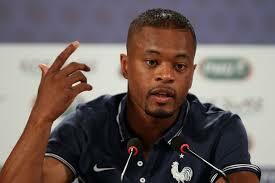 “They translate it as I am against the gay people,” Evra said on Twitter. “I am not homophobic, I love everyone. So if I offended someone I apologise. But it is not my intention. I understand equality. You have to be free whatever you do in life.